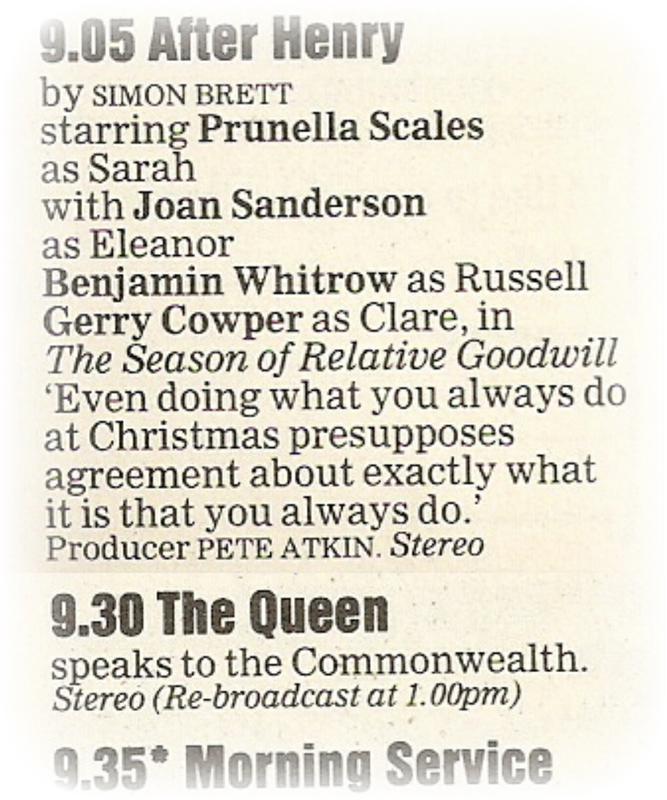 Whenever Radio 4 (or Radio 7 or 4 Extra) repeats the special Christmas edition of After Henry, The Season of Relative Goodwill, it never gets to pull off the neat scheduling trick of the original 1987 transmission. Eleanor (played by Joan Sanderson): I really think you two should be getting dressed now. 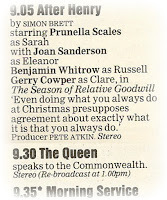 Sarah (played by Prunella Scales): What? Eleanor: Well it'll soon be the broadcast. You weren't thinking of lolling around listening to Her Majesty in your night things were you? Eleanor: You have to have some standards. Sarah: Yes. Yes of course. What's the time? Eleanor: Well it's ... oh goodness, it's nearly half-past. Clare: Well I haven't got time to get dressed. Eleanor: No. Oh dear, you really should have set the alarm earlier Sarah, then you'd have had time to make yourself look respectable like me. Sarah: Yes, you look very smart Mum. Clare: I still think the hat's a bit much Granny. Eleanore; We all show respect in our own ways Clare. Eleanor: That is those of us who have any idea what showing respect means. Sarah (interrupting): It's nearly time. We'd better switch on. Eleanor: Yes. Er, Just a moment before you do. Clare. At least do your dressing-gown up. Eleanor: And empty that mouthful immediately. You can't listen to the Queen witgh your mouth full. Eleanor: Quiet Sarah. And Sarah for heavens sakes sit up straight. Eleanor: It'll have to do. You might at least have run a comb through your hair. Now don't frown Clare. (clears throat) Very well Sarah dear, you may switch the wireless on now. FX: Sound of radio clicking on. This is exactly how that half hour was broadcast with the complete edition of After Henry and The Queen's Speech. Do I detect a Stanley Baxter reference Andy? You certainly do Mark. Well spotted. The line actually spoken by Brian Capron if I recall.